The National Museum of Patriotism is about educating our country’s youth, celebrating personal achievement, motivating people to respect the rights of others, to help our neighbors, to inspire good, and to magnify love of one’s country. Our nation needs a place to learn about patriotism and citizenship. The Museum will teach Americans about the noble ideals of this great land and develop strong character in students. 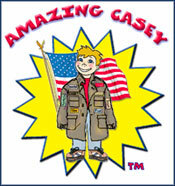 The National Museum of Patriotism features the new Casey KC3 Citizenship Exhibit. Museum founder, Nick Snider founded the KC3 Citizenship in Motion national award program. School Board Superintendent and school’s hero, L. Radloff awarded endorses Kamaron school program. Gwinnett is one of America’s largest and top school systems. Kamaron Institute provides solutions and skills and training to be more successful in work and relationships. Education solutions programs for staff and bus drivers. Kamaron Positive Label Certification program, character building book, Parenting program, teachers. 12 million children step off bus where bullying behavior happened. Most childern say bullying causes problems at school. How to tips Cyber Bullying.